The Illustrated Torah is artist, Michal Meron’s, unique pictorial interpretation of the 54 weekly sidrot of the Torah, plus a special painting illustrating the 10 Commandments. The paintings are presented on a single canvass scroll with rollers, like a real Torah. The scroll includes selected texts in Hebrew and English (JPS version) relevant to the weekly parasha and each sidrah connects to the appropriate Haftorah. The Illustrated Torah is an incredible educational tool, giving children and adults alike the opportunity to interact with the text of the Torah. We offer a large, a medium and a mini scroll. Pictured below are the mini and large scrolls which are 10 inches and 24 inches high respectively. The medium scroll, which is not pictured, is 15.5 inches high. The large scroll is 105 feet long and is most often purchased by organizations and used to fundraise. 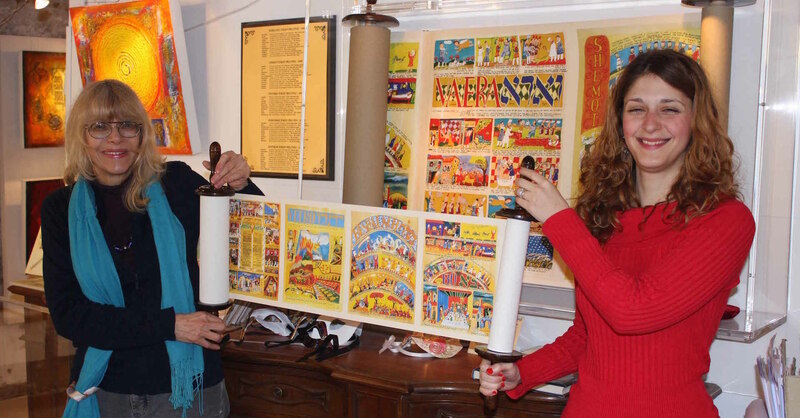 The medium scroll is 40 feet long and is purchased by organizations or individuals, and is perfect for a Torah call, for Simchat Torah and for weekly Torah studies. The mini-scroll is 30 feet long and is purchased mostly by individuals and families for personal display and for generational gifts. 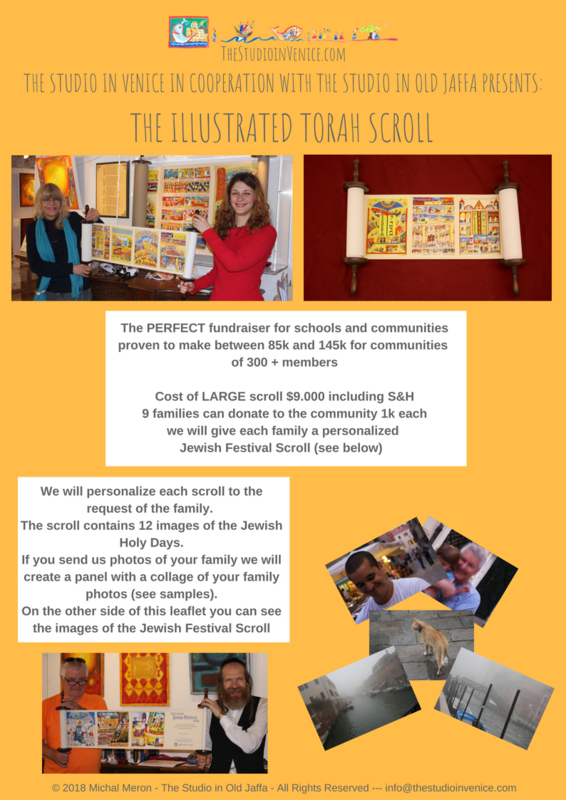 The Illustrated Torah is an amazing fundraising tool that has generated between $80,000 and $145,000 for our clients. Our fundraising program is easy to implement. Your organization simply purchases an Illustrated Torah Scroll and sells dedications for the books, parshas, aliyahs, panels, lines, or whatever divisions you choose. In our experience, donors are excited to participate in an Illustrated Torah project, because it is easy to do and because they are helping to bring this amazing piece of art to your organization. 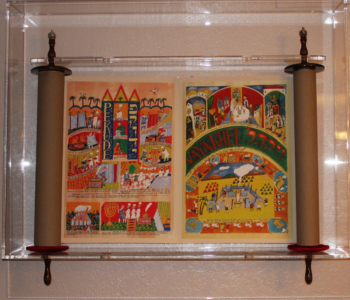 The Illustrated Torah is an incredible show piece that you will proudly display in your facility. However, its value goes well beyond the money you will raise. Across the world, Jews use The Illustrated Torah every week to study the weekly parsha. Adults and children gather around the scroll and interact with the text and illustrations, connecting to the Torah in deep and meaningful ways.